I'm Teochew nan and love Teochew food. Love reading and travelling around the world. After listening to Ajahn Keng Retreat Dhamma talk, he shared about how a lady who can see the spirits seek help from him as she could foresee misfortune in others and would warn people. However she would suffer repercussion as the spirits would punish her as they could not seek revenge on the people she helped. Ajahn Keng told her to read Access to Insight, the Anatta Sutta. I do believe as my brother could see spirits since he was a baby. He would see spirits with green eyes. As for me, I could sense and feel negative energy in some hotel. When I chant kuanyin pusa or Om Mani Padme Hum the thing would go away. You can click here to read Anatta-lakkhana Sutta: The Discourse on the Not-self Characteristic. "What do you think of this, O monks? Is form permanent or impermanent?" "Now, that which is impermanent, is it unsatisfactory or satisfactory?" "Now, that which is impermanent, unsatisfactory, subject to change, is it proper to regard that as: 'This is mine, this I am, this is my self'?" "Indeed, not that, O Lord." "What do you think of this, O monks? Is feeling permanent or impermanent?" "What do you think of this, O monks? Is perception permanent or impermanent?" "Now, what is impermanent, is it unsatisfactory or satisfactory?" "What do you think of this, O monks? Are mental formations permanent or impermanent?" "Now, those that are impermanent, are they unsatisfactory or satisfactory?" "Now, those that are impermanent, unsatisfactory, subject to change, is it proper to regard them as: 'They are mine, this I am, this is my self'?" "Now what do you think of this, O monks? Is consciousness permanent or impermanent?" "Now, what is impermanent, is that unsatisfactory or satisfactory?" "Now, what is impermanent, unsatisfactory, subject to change, is it proper to regard it as: 'This is mine, this I am, this is my self'?" "O monks, the well-instructed noble disciple, seeing thus, gets wearied of form, gets wearied of feeling, gets wearied of perception, gets wearied of mental formations, gets wearied of consciousness. Being wearied he becomes passion-free. In his freedom from passion, he is emancipated. Being emancipated, there is the knowledge that he is emancipated. He knows: 'birth is exhausted, lived is the holy life, what had to be done is done, there is nothing more of this becoming.'" This the Blessed One said. Pleased, the group of five monks were delighted with the exposition of the Blessed One; moreover, as this exposition was being spoken, the minds of the group of five monks were freed of defilements, without attachment. Indeed, at that time there were six arahants in the world. I was upset that I couldn't attend Ajahn Keng Dhamma talk in late April as I had to attend my sibling's wedding dinner. Fortunately with the advance of technology, I could listen to eminent Singaporean monk, Ajahn Keng Dhamma talk in the comfort of my home. 1) To undertake the training to avoid taking the life of beings. This precept applies to all living beings not just humans. All beings have a right to their lives and that right should be respected. 2) To undertake the training to avoid taking things not given. This precept goes further than mere stealing. One should avoid taking anything unless one can be sure that is intended that it is for you. 3) To undertake the training to avoid sensual misconduct. This precept is often mistranslated or misinterpreted as relating only to sexual misconduct but it covers any overindulgence in any sensual pleasure such as gluttony as well as misconduct of a sexual nature. 4) To undertake the training to refrain from false speech. As well as avoiding lying and deceiving, this precept covers slander as well as speech which is not beneficial to the welfare of others. 5) To undertake the training to abstain from substances which cause intoxication and heedlessness.This precept is in a special category as it does not infer any intrinsic evil in, say, alcohol itself but indulgence in such a substance could be the cause of breaking the other four precepts. Besides reading the sutra, we must also meditate. In this fast paced life in Singapore,the most expensive city in the world, we face stress and worry in our daily life. We must take the time to be quiet, to look in our inner self through meditation. I spend about 25 to 45 minutes to meditate. Sometimes I feel contented to just meditate and cast all those wondering thoughts aside and focus on my breath and chanting. Just stay in the moment and not waste the time worrying about the future or thinking about the past. To be fully present in the moment. "To detox the mind, we needs sīla (moral conduct), samādhi (Concentration), and pannā (wisdom). The mind is affected by external factors due to three poisons; greed, hatred and delusion inside every living beings be it human or animals. " In March Ajahn Keng gave Dhamma talk on late March. Sadly I could not attend as I had to attend my brother' wedding and I had bad flu the next day. I hope to attend his Dhamma talk. In the talk, he emphasised on the importance of meditation and observing 5 or 8 precepts. Tsz Shan Monastery is one temple I want to visit. Maybe I can visit Hong Kong in November this year. Tsz Shan Monastery (Chinese: 慈山寺; ) is a large Buddhist temple located in Tung Tsz, Tai Po District, Hong Kong. Within the Tsz Shan Monastery, an outdoor bronze Guanyinstatue, 76 meters in height, is the second highest in the world. Tsz Temple completed its construction and opened to public visitors in April 2015, led by the Venerable Kok Kwong HHCKLA. Much of the monastery building funds were donated by local business magnate Li Ka-shing. I'm delighted to know that Ajahn Keng will be giving Dhamma talk this month! But then I realised that my youngest brother has wedding dinner on late March. I could only attend 1 dharma talk. The talk is near Labrador Park and I really appreciate that Ajahn Keng is giving Dhamma talk. 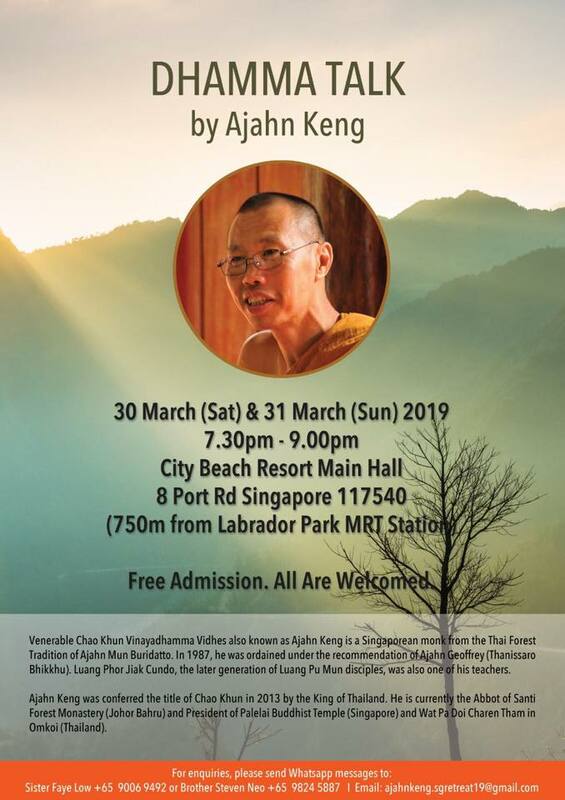 Even thought I'm more inclined towards Mahayana Buddhism, but I enjoy listening to Ajahn Keng, a Singaporean monk who is is also known as the forest monk which is the Theravada Buddhism whereby monks go for alms and meditate in the forest. For me I don't think there is not much different as both are Buddha's teaching. I came across the sharing on Causes and Conditions, Buddhism in Every Step from Fo Guang Shan, Venerable Hsin Yun. To read more, you can click here for Causes and Conditions pdf file. The Buddhist teachings differ from academic knowledge. Academic knowledge typically focuses on the explanation of appearances. It is an interpretation of reality based on name and form. In contrast, Buddhism teaches us to develop a penetrative understanding of the nature of phenomena that is perfect and complete. Consider the human hand. Common knowledge simply says that it is a hand. Medical science looks at it as a structure of bones, muscles, nerves, and cells.Literature define the hand in terms of style, gesture,and expression. A philosophical analysis of the hand sees it as a symbol of destiny and friendship. In physics, the opening and closing of the hand is described by its forces and movement. In each analysis, the hand is regarded as real. The hand exists. In contrast, the Buddhist view of the human hand penetrates its essence. This view sees the hand itself as an illusory and temporary form, unstable in nature, which will eventually decay and vanish. As a phenomenon, the hand is empty. Suppose one were to extend the hand and make a grasping motion. Common knowledge would say the hand moved and that some air and dust were grasped. The Diamond Sutra says that such things are “like dreams, illusions, bubbles, and shadows, like dew and lightning.” The grasp only exists because of the combination of certain causes and conditions. Cause and condition,One can find springIn the midst of autumn frost and winter snow. Lately, I been very busy with work and so I neglected on meditation and chanting mantra. To my shock, during work, I was angry and I shouted. I rarely shout when I meditate and chant. One should not be complacent but must always guard our mind and be mindful of our thoughts and actions. I have to make meditation and chanting a daily ritual. Also its good to listen to Dharma talk by months. Its a good reminder to do good and observe the five precepts and be mindful of the three poisons of greed, hatred and delusion. The video below is produced by Venerable Hai Tao and his team from Taiwan. This video explains the origin of Om Mani Padme Hum. When I was young, I didn't know that Buddhism is divided into two main Buddhist schools of thoughts namely the Mahayana (Great Vehicle) and Theravada Buddhism (School of the Elders). Mahayana Buddhism is based on the Bodhisattva path whereas the Theravada Buddhism on following the Eight noble path self-enlightenment to be an Arhant. Growing up in a typical Chinese family in Singapore, we pray to Buddha, Kuanyin pusa or Avalokitesvara Bodhisattva and other various Chinese deities like Earth god deity （土地公） and others deities. So my family is a typical Taoist family who also pray to Buddha and Kuanyin bodhisattva besides many Taoist deities. My parents are not able to explain to me the difference on Taoism and Buddhism so I started reading up on what is the difference. As I read more, I identify myself as a Buddhist but I also pray to Taoist deities with my parents. 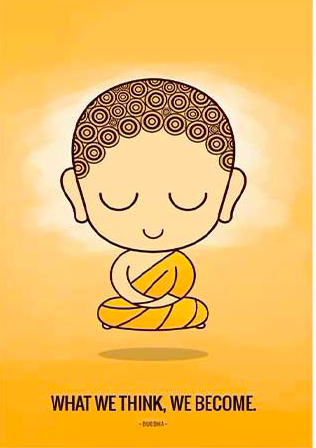 Instead of focusing on the differences of Mahayana and Theravada, I focus on the core teaching of Buddha which are the Four Noble truths, the Noble Eightfold path, Karma, be mindful, meditate and just do good. After listening to both venerable masters Sheng Yen and Chao Khun Keng, both emphasised the importance of doing good and following on the precepts. I enjoy listening to Buddha's teaching from both Mahayana and Theravada venerable monks namely Venerable master Sheng Yen and Chao Khun Keng respectively. Sadly Master Sheng Yen passed on in 2009. But luckily there are many videos on Buddhism by Master Sheng Yen. On the topic of karma, in the video, Do you want to be a ghost? by venerable Chao Khun Keng, he shared that a person who slaughter chickens for a living suffered from neck pain as he bent the neck of chickens before slaughter. After he stop selling chickens, his neck is no long in pain. In this life, I hope to share what I learned from the venerable monks with others on Buddha's teaching as it can help people just as Buddha's teaching has helped me. Since we do not own the current physical body forever, why must we hold on to anger and hatred forever? Just let go and send out good will and joy to others. In Shakyamuni Buddha's time, Buddhism had not split into Mahayana and Hinayana, though Mahayana ideas were already circulating. The distinction between Mahayana and Hinayana and their later developments reflect the different ways of interpreting the Buddha's ideas and the precepts. While Hinayana Buddhism is a conservative form of Buddhism that adheres to Pali scriptures and the Buddha's original teachings, Mahayana Buddhism emphasizes the Bodhisattva spirit in delivering senting beings and transforming the world. Sometimes people wonder why the evildoer escape from their evil deeds and go unpunished in this lifetime and why good person suffer. Sometimes karma manifest in this lifetime, sometimes karma will just happen in next life or next next life. The movie Running on Karma is a film on Buddhist concept about Karma. The protagonist is a Buddhist monk who gained supernatural power of seeing a person's past life when he meditated for several days after his friend passed away. He could see what will happen to the person due to the person past life. He gave up monkhood and went to work as a stripper after he realised he could not stop what will happen. He helped the police woman escaped death twice or thrice but later realised that it was the police woman who saved herself by her kindness. However in the end, the police woman who was a Japanese soldier who killed many people was killed in the forest. He also stopped an angry police sergeant who was beating the murderer by saying to him, "One thought Heaven, One thought Hell"(一念天堂，一念地獄). I recalled in a Dharma talk by Venerable Chao Khun Keng who shared that our mind is very powerful and we needs to be aware of it. Therefore, we always have to be mindful of our thoughts as our actions are driven by our thoughts.